Murder is Everywhere: What Ever Happened to Golden Dawn? 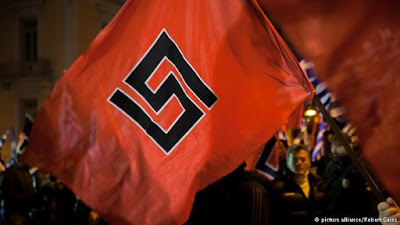 A little less than two years ago I wrote about Chrysi Avgi (Golden Dawn), the Greek political party which barely masks its veneration of Hitler and his blame-spewing hatred that brought such horror to the world. At the time I mentioned the serious criminal charges lodged against virtually every one of the party’s then eighteen members of Greece’s parliament following the murder of a Greek by Golden Dawn supporters, yet its popularity has continued to rise and in the most recent general election Golden Dawn ranked third in votes received—while its leader and other members waited in jail to be tried as a criminal organization masquerading as a political party. So what else has happened since I wrote the piece on May 24, 2014? Yep, you guessed it. Tipota. Nothing. 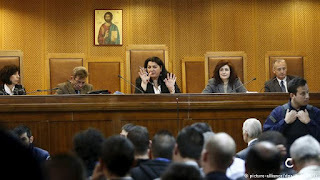 It’s as if the prosecution is afraid to lose, the defendants are afraid to be judged, and the judges…well, it’s Greece. With jackboots battling socialists for power in Europe, and immigrants the targets of animosity on all sides, Greece just seems to want the trial to go away. It was billed as Greece's ‘trial of the century' when it started a year ago, with assurances that, despite the country's notoriously slow judicial system, the trial would be over in 18 months. 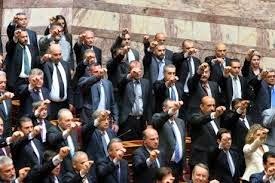 This was the sensational trial of 69 Golden Dawn members, including their leader Nikolaos Michaloliakos, on charges of running a criminal organization. The case file of charges against them ran to over 30,000 pages. The first court session took place exactly a year ago, on April 20, and was immediately adjourned, setting the tone for a trial marred by delays, inefficiencies, and lately a lawyers' strike which has seen no court sessions take place at all since January 12 this year. The trial that initially had the public and the media enthralled soon fell off the news agenda as more pressing issues vied for the public's attention. In the year that's elapsed, it gets a passing mention if at all, and almost always in the context of courtroom dramas rather than the gravity of the charges brought against a political party currently serving in the Greek parliament. It was the death of a Greek left-wing rapper, Pavlos Fyssas, in 2013 which finally spurred the authorities into action after a string of attacks on immigrants by Golden Dawn members. His murderer, Giorgos Roupakias, was held for the maximum possible time for detention without charge under Greek law and released into 24-hour house arrest last month under the shadow of a trial that is going nowhere fast. According to one of the prosecution lawyers, Thanassis Kampagianis, the trial proper only began in September last year. "In reality the court has been going on for four months if we talk about the court the way people understand the court, not procedural matters, not the lawyers fighting over these things," he told DW. The constant interruptions from the defense side struck many as a deliberate delaying tactic to bore the public and the media into losing interest, a point Kampagianis agrees with. 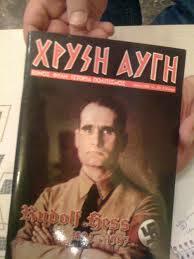 "It is obvious that the strategy of Golden Dawn is to have as little publicity as possible. There have been incidents inside the courtroom that reveal that this to be the case, threats against journalists and photographers and even physical violence against a journalist," he said. The glacial speed of court proceedings, at one point stalling over the lack of a projector to show video and photographic evidence to witnesses, has frustrated many of those involved, and the solutions reached often come across as nonsensical. "Something like the projector needs to be decided by court, you can't just bring your own. The court decided that we will first have the witnesses and then we will be able to project the videos, which in the prosecution's opinion is a wrong decision," says Kampagianis. Then there was the issue of the location of the trial in Korydallos prison, a location with poor public transport connections and away from the public eye. 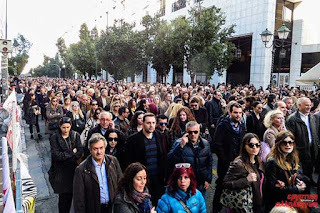 The prosecution has petitioned for the transfer of the trial venue to a more accessible location in central Athens, which is still an ongoing issue. To add to the delays, lawyers in Greece have been on strike for the last three months in protest of the government's proposed pension reform laws. Kampagianis explains that the Athens Bar Association (DSA) allows the strike to be broken for extraordinary cases. They denied such permission for the Golden Dawn trial. Stressing that he and the other prosecution lawyers support the strike and have no financial incentive for the strike to end since they are working pro bono, Kampagianis said "My view is that the DSA responded with formalities, not the crucial issue, which is that you have an extraordinary case where you have a criminal organization that has perpetrated all these crimes, masquerading itself as a political party inside parliament. This is an extraordinary case, it's very dangerous for the democratic system, for political and human rights, so there should be a response to the magnitude of this case." In a cafe near the enormous grey Korydallos prison, Chrysa Papadopoulou and Andreas Tzelis, both prosecution lawyers for the Fyssas family, explain how the family is holding up in the face of the delays. "They are disappointed with how events are evolving, or rather, not evolving," Papadopoulou told DW. "This trial concerns all of Greek society, not just the loss of the Fyssas family. They are determined that to see this trial through to the end," adds Tzelis. The DSA could not be reached for a statement. Eleftheria Koumandou, a journalist for Golden Dawn Watch and Athens 98.4 FM, said that of the 132 witnesses in the trial, only 16 have so far given evidence. "We consider the Golden Dawn trial a very important trial and the outcome will have immediate consequences for the social and political life of the country. We consider it a basic point that witnesses need to be supported, especially the migrants coming to testify against this organization. They need to get justice in society, not just in the courtroom," she told DW. The Golden Dawn defense team responded to DW's requests for an interview by saying that they are not making any statements until the trial concludes. With talks between lawyers and the government in a deadlock, it's anyone's guess when the trial will resume. In the face of ongoing economic uncertainty and a burgeoning refugee crisis, Golden Dawn are resuming their prior activities. 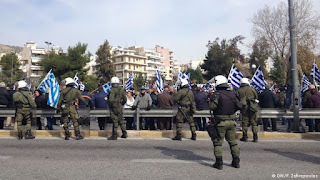 Last week, Golden Dawn supporters at an anti-immigration rally in Piraeus attacked anti-fascists and a journalist, allegedly in full view of riot police who did not intervene. 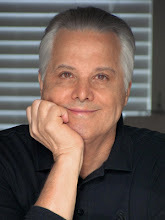 Perhaps we’ll have to wait until my new book (Santorini Caesars) comes out in September to find out. :) Let’s hope not. PS. Happy Birthday, Azi! You’re my super-hero. OK, Jeff, all fun aside, this is deadly serious and an outrage. Golden Dawn is so incredibly dangerous, like the German Brown Shirts whose fascist gangs beat up and killed people who were Jewish, dissidents, workers on strike, people demonstrating, etc. It's ridiculous that the government either fears prosecuting Golden Dawn members or doesn't want to rock the boat and set off more right-wing violence. 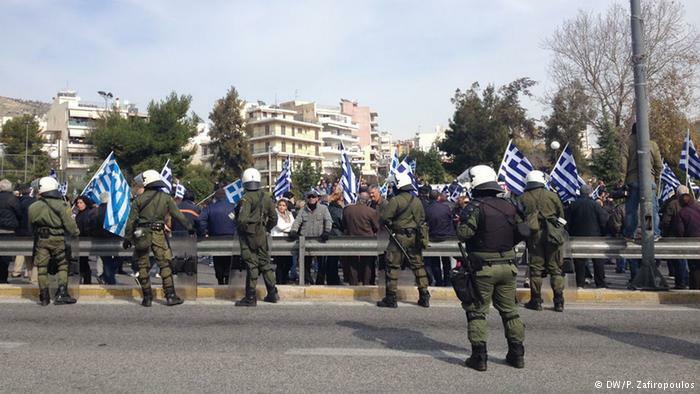 Two friends of mine who follow events in Greece said when these neofascists were arrested -- that nothing would happen. To allow this criminal pro-fascist group to intimidate people, even lawyers and judges, is just the opposite of what needs to be done. It's like the growing pro-fascist National Front in France which is allowed to carry out violence and spew its anti-immigrant, Islamophobic venom as they spouted anti-Semitism until recently -- although they still mean it. Pavlos Fyssas was a popular rap musician. He was killed brutally by a group of Golden Dawn gangsters. They should go to jail for years and the government should exert control over the group. This is disappointing. There are so many kind, generous Greeks helping the migrants. I'm sure their numbers are much greater than the far-right's. neofascists. That is urgently needed. I've read this is happening in Germany with good folks marching and countering the far-right. This is the time. I'll send this article to my friends. You're right, Kathy, there is no fun in any of this. Let's hope there's fair justice. Few truer words were ever writ. My hope will live as long as life itself, but expectations exist on a lower strata. Hope seems to be eroding across the planet. Greece deserves better. 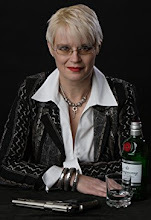 I look forward to your book. Finally, a tale more ridiculous than our Presidential elections in the US, where one candidate speaks of banning certain people from the country and building fences with neighboring countries. Your comment, "Hope seems to be eroding across the planet" holds very true! I think Bernie Sanders' supporters have hope. Where will that hope go once the conventions happen? Will their hopes be dashed or will there be another movement continuing to press for what his campaign's program is about which many people believe in? If it's reasoned hope, one trusts that Bernie's supporters recognize that the next president will deeply affect their generations' futures far beyond a presidential term in office...because the Supreme Court will be reshaped by our next president. And vote accordingly. Well, young people do have hope and optimism. Once things become business as usual and colleges cost a fortune, student debt piles up, good jobs are hard to find, housing costs are high, wars continue, and police brutality and bigotry continue, what will these young people do?